Kavipriya, a 11 year old girl, who is suffering from Severe Multicore Myopathy Disease that taking her to its extreme level of Cardiac disease (MCM). An unusual fatal congenital myopathy symptoms were described in Kavipriya at her age of 6. Initial stage she was hospitalised with the symptoms of, frequent falls while walking, difficulty in getting up, pain both thighs and progressive pain at elbow region with restriction of movements associated with swelling that led doctors to diagnosis the case of Congenital Myopathy Multicore Disease type with Psoriasis Vulgaris with severe progressive weakness of muscles. Kavipriya lost the movement of her legs 3 years before. Later, the weakness of muscles spread to her back that resulted her a complete bed patient. Now the present condition is, she is losing the strength of her hands, eye vision and hearing capacity. Muscle biopsy showed type I fibre smallness with central nuclei and focal decrease in oxidative enzyme activities affecting mainly larger type II fibres. Longitudinal sections from glutaldehyde-fixed araldite-embedded material stained with toluidine blue revealed multiple small foci of myofibrillar degeneration (multicores) along the muscle fibres. Electron-microscopic examination confirmed the presence of multicore lesions affecting mainly the larger fibres. In addition, there were definite degenerative changes involving the smaller fibres with central nuclei. The degenerative process started around the pericentronuclear zones with diffuse extension along the whole length of the muscle fibres resulting in severe cardiac arrest. It is therefore suggested that the patient might have either had 2 co-existing myopathies viz. multicore disease and pericentronuclear myopathy or a single entity with combinations of features. 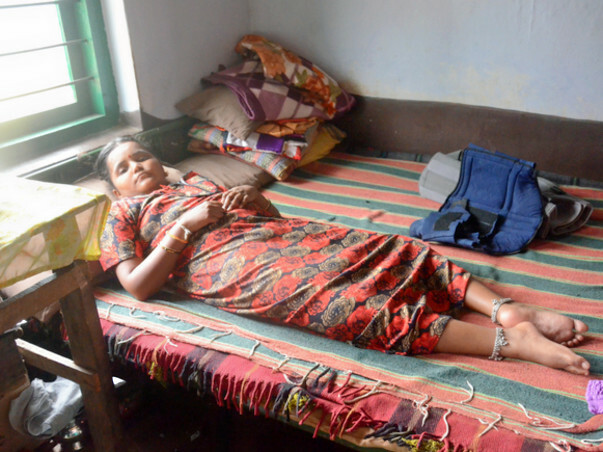 Kavipriya's mother was strongly advised by the doctor to provide her for an immediate and continuous treatment but, this mother (a daily wage labour) could not even consult the doctor regularly due to lack of hospital fees. The treatment itself required a huge amount of fees that this mother seeks helping hands for her only daughter. We request your kind help and support to bring Kavipriya back to life by Donating, Praying, and Sharing this with your family and friends.